It was with great joy that we welcomed Tasha Grigor as the newest member of our community at the beginning of June. Tasha’s two brothers Andrew and Hayden, accompanied her to the Abbey, just to make sure she got here safe and sound and probably also to check us out! As their parents, Robert and Janice, are already deceased no doubt Andrew and Hayden wanted to meet the community and ensure that Tasha was coming to a safe place where she could be happy and fulfilled. It was wonderful for us to meet them and we must have passed muster as Tasha entered the next day and they said their goodbyes happily in the knowledge that we are all a pretty normal bunch with whom Tasha would fit right in! Tasha has had a wide range of experiences before joining us including a year as an exchange student in Japan where she lived with a Japanese family and learnt much about their culture and language. She then followed in her mother’s footsteps in completing a degree in nursing and has worked in both hospitals and community nursing situations. After some years Tasha moved into geriatric nursing – a ministry dear to her heart. Tasha nursed both of her parents in their last days which must have been a great comfort to them. She then worked at an Aged Care Facility in Melbourne for some time, prior to coming to Jamberoo. In the month before joining us Tasha made a pilgrimage to Fatima for the centenary celebrations of the appearances of Our Lady in Portugal. 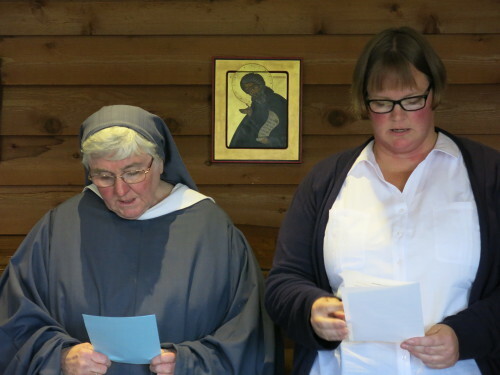 The pilgrimage also took in parts of France and Spain and ended at Jamberoo Abbey! We are very happy that the last stage of her pilgrimage led her here and in the tradition of peregrinatio, we hope and pray that here, she has “found the haven of her resurrection”!